See how You Can Save Money on Your PPC Ads! ClickMeasure Pro's Pay Per Click Management Tools Do it ALL! Optimize your campaigns across multiple search engines using the automated Pay Per Click Management Tools. Take advantage of the automated alerts that tell you what's working and what is not. Get the information you need to make informed decisions that can increase your advertising ROI. We specialize in helping you make the most of your paid search marketing budget. 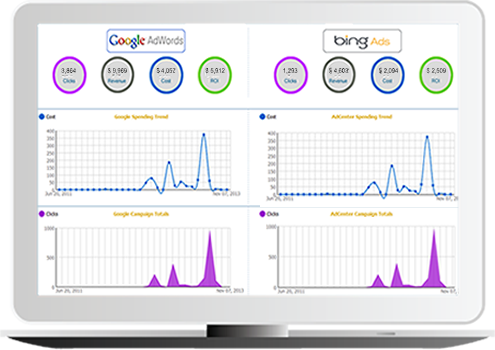 The ClickMeasure Pro pay per click Campaign Management Software provides everything you need to optimize your campaigns for maximum ROI. Reduce your workload with automated paid search campaign management. Get daily performance alerts and recommendations. Integrated with Google AdWords and Bing adCenter (Bing/Yahoo) you can manage all your campaigns with a single interface. Customizable alerts let you focus on keyword optimization and bid management to get the most out of our advertising budget. Discover keyword ideas to expand your campaigns. Eliminate wasted spending with negative keyword finders. Research your target performance. Make the most of your time by letting the management tools take the grunt work out the day to day tasks.Add or adjust any element of your campaigns anytime. Get the right answers in real time that allow you to adjust your campaigns as needed to reduce unnecessary ad spend.